The stacks of books littered around my apartment suggest I read (and kept) at least 37 physical books in 2018. Much more were read and passed along to friends, mobile libraries or read as e-books/ journal articles. Amidst all that information, my two defining reads of 2018, were pieces I’ve read and re-read many times over the last few years. I read them for their precision, for their ability to cut through the noise and just provide (remind) me with the clarity I’m seeking. I’m a firm believer that humans reach their apex when we are creating (stories, factories, hair companies, multi-billion dollar businesses, farms, SOPs etc.,) and in Deep Work, Newport makes the suggestion that we often allow less cognitively demanding tasks, “shallow work”—responding to emails, attending unimportant meetings, etc., stand in for creating real, meaningful, innovative work. The kind of work that takes concentrated amounts of thinking, learning, and mastery, to produce. 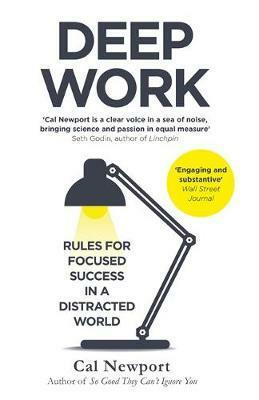 Deep Work not only makes the case for learning how to concentrate and engage in stretches of intense, productive work, it lays out practical steps for doing so. I come back to Deep Work every time I have a major project or need long stretches of “thinking time” because, ultimately, mastering the discipline required to produce meaningful, excellent work, is an essential part of any well lived life. In 2019, I expect to still find these sources part of a cluster of ‘North stars’ (nautical misappropriation, aside) that provide guidance and remind me of True North-what actually matters.